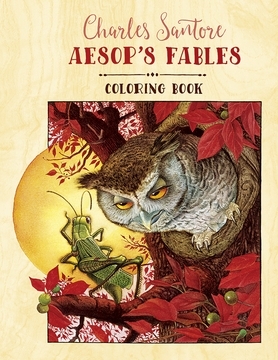 Aesop, the legendary fabulist of ancient Greece, gave us rules to live by through his famous fables. His stories teach us about the benefits of being kind, humble, cautious, and grateful. They teach us about fairness, hard work, and the difficult things in the world. And they teach us that it is best to be ourselves. 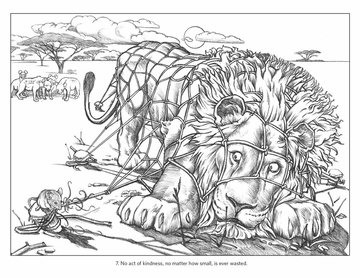 When artist Charles Santore set out to illustrate his selection of Aesop’s fables, he chose those featuring animals rather than people. The animal kingdom, with its huge variety of characters, provides perfect examples of what it means to be human. The wily fox, the stubborn goat, the wise mouse, and all the other animals, in their own ways, represent the different parts of who we are. Santore, who is best known for his lush, narrative illustration of children’s classics, has decided to share his drawings of Aesop’s fables here for you to color. His black-and-white drawings helped him create the watercolor paintings shown on the inside of this coloring book’s covers. As you color, you can think about how you might draw some of these stories. 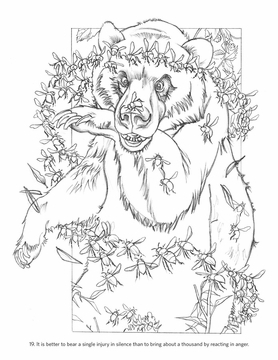 When you’ve finished, you can use the blank pages at the back of the coloring book to illustrate your favorite fables. “The Crow and the Pitcher.” Moral: In a pinch a good use of our wits may help us out. “The Wolf and the Crane.” Moral: In serving the wicked, expect no reward, and be thankful if you escape injury for your pains. “The Wolf and the Lamb.” Moral: Hypocritical speeches are easily seen through. “The Wolf in Sheep’s Clothing.” Moral: Harm seek, harm find. “The Vain Jackdaw.” Moral: Fine feathers do not make fine birds. “The Lion and the Wild Donkey.” Moral: Might makes right. 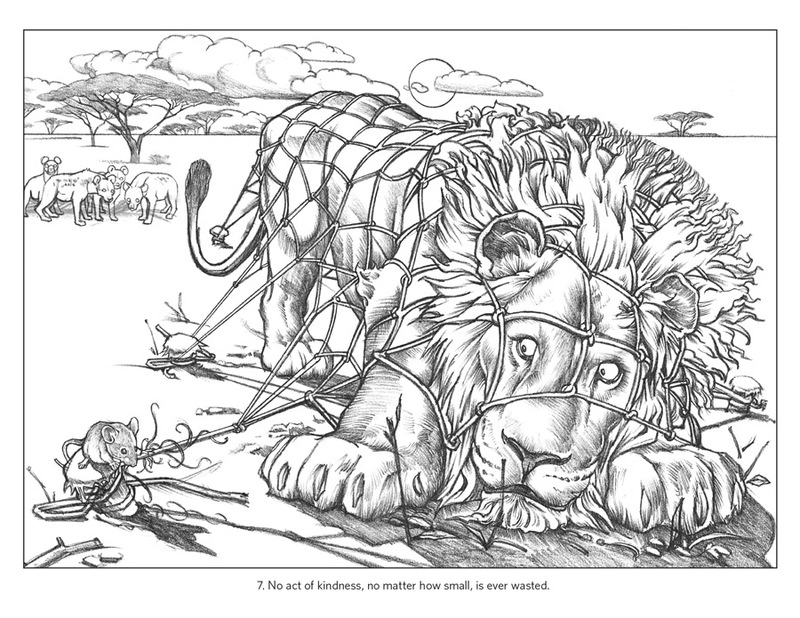 “The Lion and the Mouse.” Moral: No act of kindness, no matter how small, is ever wasted. “The Donkey in the Lion’s Skin.” Moral: No disguise will hide one’s true character. “The Old Lion and the Fox.” Moral: Take warning from the misfortunes of others. “The Monkey as King.” Moral: A position earned without merit is as easily lost as gained. “The Fox and the Grapes.” Moral: It is easy to despise what you cannot get. “The Wild Boar and the Fox.” Moral: Lost time cannot be recalled. “The Crow and the Swan.” Moral: You may change your habits but not your nature. “The Eagle and the Crow.” Moral: Thoughtless imitation will end in danger. “The Two Goats.” Moral: It is better to yield than to come to misfortune through stubbornness. “The Tortoise and the Eagle.” Moral: If men had all they wished, they would often be ruined. “The Ox and the Frog.” Moral: Self-conceit may lead to self-destruction. “The Crab and His Mother.” Moral: Example is more powerful than precept. 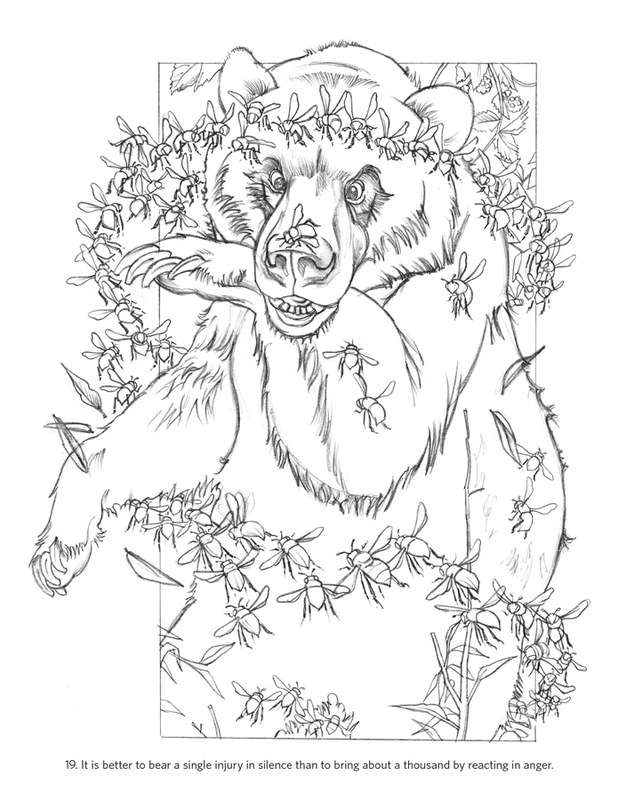 “The Bear and the Bees.” Moral: It is better to bear a single injury in silence than to bring about a thousand by reacting in anger. “The Grasshopper and the Ants.” Moral: Idleness brings want. “The Grasshopper and the Owl.” Moral: Flattery is not proof of admiration.